Luxury Hair & Beauty Brands Including Kerastase, Redken, Aveda, ghd & Many More. FREE DELIVERY on orders over £20, shop now for beauty products. Offer condition: 10% is redeemable against Kerastase products only. This offer is only available on Shop Rush and not valid in any Rush Hair salons. All retail products are subject to availability, whilst stocks lasts. This offer cannot be used in conjunction with any other offer. Not valid with electrical retail. No cash alternative. Rush Hair and Beauty reserves the right to withdraw this offer at any time. Offer only valid from 14 - 31 August 2017, inclusive of these dates. Kerastase travel companions/travel sets are not included in this offer. Do not miss another RUSH shop voucher! 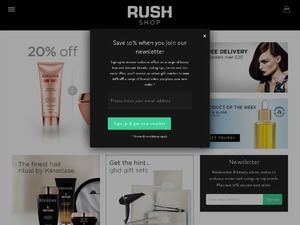 Simply leave your e-mail address and we'll always keep you informed of new vouchers for RUSH shop. Offer condition: Plus Next Day delivery. Offer condition: 20% off Kerastase ends midnight 28.02.16 and applies when you spend £40 on Kerastase only. Your voucher code is valid for 3 uses only and must be added at basket. Voucher codes cannot be redeemed against gift cards. Rush Shop reserves the right to withdraw the offer at any given time. Free next day delivery orders applies to UK mainland addresses only, must be placed before 3pm and will be delivered the next working day, this offer applies to order value of £60 or more. Read our Delivery Policy. Offer condition: Excludes the following brands: ghd and MoroccanOil. Your voucher code is valid for 3 uses only and must be added at basket. Voucher codes cannot be redeemed against gift cards. Rush Shop reserves the right to withdraw the offer at any given time. Free next day delivery orders applies to UK mainland addresses only, must be placed before 3pm and will be delivered the next working day, this offer applies to order value of £35 or more. Read our Delivery Policy. Offer condition: Offer ends midnight 14.02.16 and applies when you purchase your shampoo with a full price conditioner or mask from the following brands: Kerastase, L'Oreal Professionnel, Shu Uemura, Alterna, Redken, KMS, Matrix, Mizani and Pureology. 10% off applies to the shampoo only. Your voucher code is valid for 3 uses only and must be added at basket. Voucher codes cannot be redeemed against gift cards. Rush Shop reserves the right to withdraw the offer at any given time. Free UK delivery applies to UK mainland addresses only, on orders over £20. Offer condition: Must spend £50 on the following brands in order to qualify: Kerastase, Redken, Shu Uemura, Pureology, Matrix & Mizani. Voucher code is valid for 3 uses per person. Offer condition: Offer is available when you spend £25 or more at shoprush.com and exclude the following ranges: Aveda, KMS, MoroccanOil, ghd, electricals and gift cards. Must fulfil minimum spend and add code at basket. Rush Shop reserves the right to withdraw this offer at any given time. While stock last. Free delivery applies to orders over £20 and is valid for UK Mainland addresses only. Offer condition: ghd gift offers applies when you buy one of the following stylers: ghd V Gold Series Classic, Max or Mini, or the ghd Platinum white or black. Excludes ghd Pink Vintage (Breast Cancer Charity) Range. Free gift applies whilst stock lasts. Ends midnight 30.09.2015. Must add code at basket. 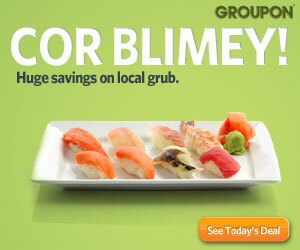 Your voucher code is valid for 3 uses per person and must be added at basket. Promotional prices are based on original RRPs. Rush Shop reserves the right to substitute freebies at any time. Some products may be restricted to UK delivery.Free next day delivery orders must be placed before 3pm and will be delivered the next working day, this offer applies to order values of £60 or more. Read our Delivery Policy and Terms & Conditions before completing checkout. Offer condition: St Tropez free gift offers applies when you spend £35 or more on St Tropez. Free gift applies whilst stock lasts. Ends midnight 31.10.2015. Must add code at basket. Your voucher code is valid for 3 uses per person and must be added at basket. Promotional prices are based on original RRPs. Offer condition: ghd gift offers applies when you buy any ghd hair dryer. Free gift applies whilst stock lasts. Ends midnight 31.10.2015. Must add code at basket. Your voucher code is valid for 3 uses per person and must be added at basket. Promotional prices are based on original RRPs. Rush Shop reserves the right to substitute freebies at any time. Some products may be restricted to UK delivery.Free next day delivery orders must be placed before 3pm and will be delivered the next working day, this offer applies to order values of £60 or more. Read our Delivery Policy and Terms & Conditions before completing checkout. Offer condition: One shampoo free per order. Must add two items including conditioners, masks, hair oils and serums. Third item Free. See full terms and conditions and delivery policy for details. Whilst stocks last. Latest voucher code valid at a time of promo publication was entered to be working from 2017-11-06.